Details : 26" Ev. Dip. E-M. Re. Bloom 7"
Rose pink with a large yellow eye. Huge blooms that are full, rounded and ruffled. Details : Ht 30" Tet Ev. M Re. Bl 5.25"
Sunfast black violet, grass green throat, heavy substance, superb form. Limited stock - 1 per customer. Details : Ht 27" TET. Re. Bl 5.5"
Details : 30" Ev. Tet. E-M-L Re. Bl 7"
Lavender blend with gold edge, green throat. 5 way branching 40+ buds. Details : 20" Ev. Tet. 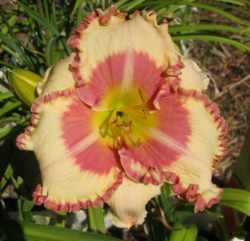 E-M. Bloom 6"
A peach yellow bloom with a pink blush, white midribs and wire gold edges. 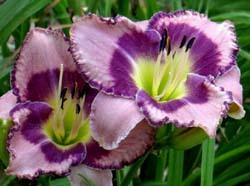 A beautiful, rounded daylily with large ruffles. Fertile. Limited stock - 1 per customer. Details : 30" Ev. Tet. E-M. Re. Bl. 6.5"
A smooth clear lavender-lilac with a slightly darker watermark etched eye above a large citron green throat. Petals are edged in bright gold. Details : Ht 26" DIP Ev E-M Re. Bl 5"
Firstly this is not a small bloom. A pastel cream yellow bloom that is almost covered by a cherry red eye above a bright green throat. Stunning!!! Details : 30" Ev. Tet. E-M Re. Bl. 4.25"
A beautiful rounded, ruffled bloom of cream with multiple layers of shades of blue rings in the eye. Deep green throat. Limited stock - 1 per customer. Details : 26" SEv. Tet. M. Re. 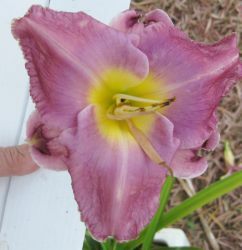 Bl 5"
Pale yellow with a huge plum-purple eye and picotee edge. A great parent for patterned eyes. Details : Ht 30" TET. Ev. E-M Re. 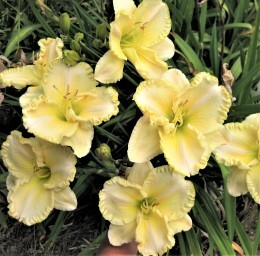 Bl 7"
Large warm ivory yellow to soft apricot blooms. Limited stock. Details : 28" Ev. Dip. M. Re. Bloom 6"
Deep rose pink with a large lime-green throat. Slightly recurved and ruffled. Pretty. Coral red with a large deep red band that surrounds a large lime throat. Blooms are Crispate, Cascade & Spatulate on tall scapes, great for a backround filler. Bright, happy & cheerful. Details : 30" SEv. Tet. M Re. Bl 6"
A beautiful rich rose burgundy with a bubbly silver to gold edge. 28 buds. Details : Ht Dip. Ev. 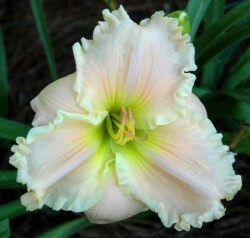 Bl 6"
Beautiful soft pastel pink with a pale yellow ruffled edge above a green throat. Fragrant. Limited stock - 1 per customer. Details : Ht 30" S.Ev. TET,Mid. Bl 7"
Creamy white with a hot pink eye and edge with gold trim. Limited stock - 1 per customer. Details : Ht 34" TET. S.Ev E-M Re. Bl 6"
Lavender/mauve with a large blue watermark and also a blue and yellow double edge. Limited stock. Details : Ht 25" TET. Ev. E Re. 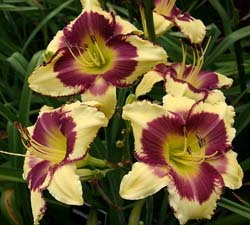 Bl 5.25"
Deep rose pink with a superbly ruffled yellow cream edge & a green throat. Limited stock - 1 per customer. Details : Ht 24" TET. Ev. E-Mid Re. Bl 5.5"
Lavender base colour bluish lavender watermark, green throat heavy substance. Limited stock - 1 per customer. 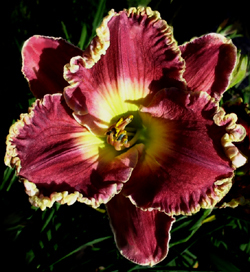 Mandarine red with a huge green throat makes this daylily unique. Very full bloom and gorgeously ruffled petals. Extremely vigorous and hardy. A standout! Limited stock - 1 per customer. Details : 26" SEv. Dip E-M Bl 6"
Pink blooms with an apricot/yellow centre surrounding a green throat. White midribs. Large loose ruffles. A deep lavender with a large dark purple eye & picotee edge. Green throat. Limited stock - 1 per customer.